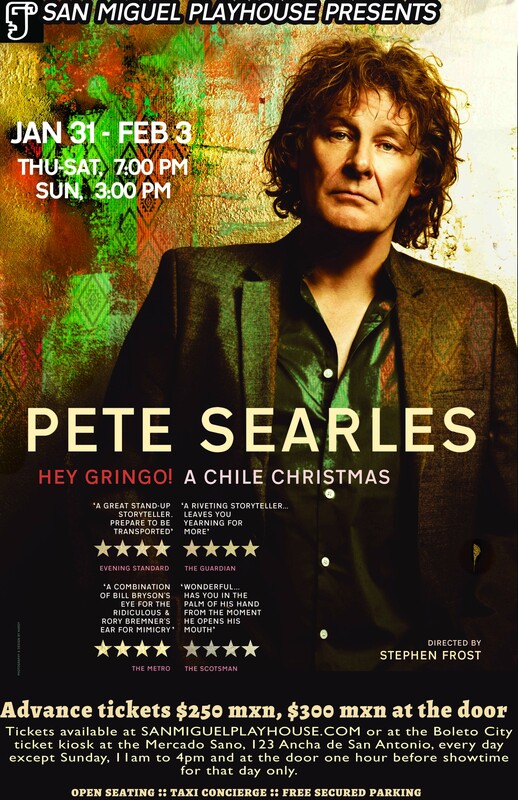 The British actor and writer Peter Searles, a veteran of stage, screen, and BBC television and radio, is bringing his one-man show to the San Miguel Playhouse. The show is called Hey Gringo! A Chile Christmas, an intensely dramatic and frequently hilarious account of Searles’ journey from the scorching wastes of the Atacama Desert in northern Chile to the shantytowns and smog-laden cities of the south, to a world of forests, lakes, and volcanoes. Accompanied by oversexed train drivers, a beautiful young revolutionary, out-of-work actors, Marxist priests, fascist police, Chilean Eco-warriors, and Pinochet’s neighbors, Searles recounts a journey that turns into a quest for truth and meaning in land torn apart by thirteen years of military dictatorship. Hey Gringo! A Chile Christmas will be presented four times only: Thursday, Jan. 31 through Saturday, Feb. 2, at 7pm; Sunday, Feb. 3, at 3pm. The San Miguel Playhouse is located at Avenida Independencia 82, and features secured free parking and taxi-concierge service. Advance-sale tickets can also be purchased for 250 pesos at the Boleto City ticket desk on the second floor of the Mercado Sano, Ancha de San Antonio 123, Monday through Saturday, 11am to 5pm. Tickets (if still available) can be purchased at the door of the theater starting one hour before showtime, for 300 pesos. This is not a reserved-seat event, so early arrival the theater is recommended.